I am so excited to have discovered this primer, a fantastic product from a great company. This is a "Certified organic, silicone free make-up primer with antioxidant, nourishing vitamin E, Jojoba oil and Edelweiss extract. This silky, fast-absorbing formulation – offering all the benefits of the primer yet without any silicone-related disadvantages - acts as a layer, keeping skin elastic and comfortable, while ensuring smooth, long-lasting make-up application." The packaging is attractive; It comes in an easy to use tube, smells fresh like lemons, glides on easily and is very moisturising and hydrating. It makes the skin very soft and smooth, and provides an excellent base for make-up. It left me looking radiant and fresh faced for 10 hours, and although my blusher had gone, my foundation remained in place. I was so pleased with the results; It does exactly what it promises and is free from all the nasties - You HAVE to buy this! I prefer to limit the amount of chemicals that go on my skin so I love that this is dermatologically tested and free of mineral oil, paraben, propylene gycol, ethanolamine and silicone! 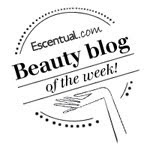 A review of their Wild Rose Moisturising Cream and Wild Rose Brightening and Line Smoothing Serum. Ooh, brilliant review. I didn't know Korres were available over here. I use their sunblock and have used a few other things they produce, including facial wash but have only ever found them in Greek pharmacies or in Hondos Centre stores, which is the Greek equivalent of Boots (if ever your in Greece, I highly recommend!). I, too, loved the packaging, natural products and lovely fragrances. Thanks for this. I feel another spend coming on! Just a quick post to say I discovered they'd opened a Korres shop in Cardiff (my poor bank balance!) and bought some of the primer. It's lovely. Their make up range was on a 2 for 1 offer, so I got two tubes!!!! What a great offer Catherine, lucky you!! That sounds great, I need a new primer, and I like that it sounds moisturising, instead of drying..
How much was it, and where do you buy Korres? ooooh fabby....was thinking of trying out a primer....may need to try this one!